Chickpeas are one of my favourite sources of plant based protein. 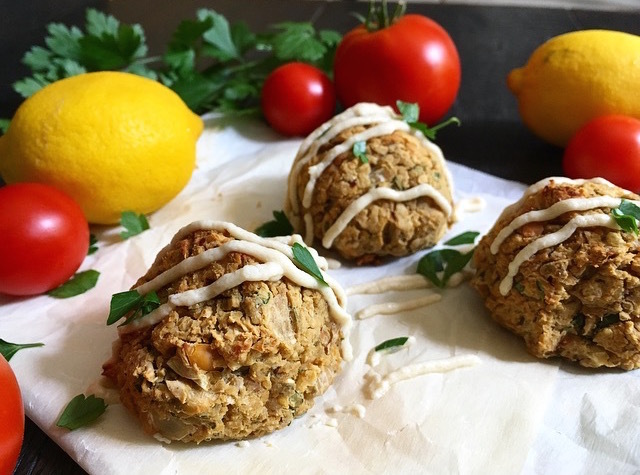 Hummus is a go to for me, but I wanted to try something a little more filling/savoury - so I came up with this simple falafel recipe. Most recipes call for pan frying, but oven baked is much healthier! Step 1: Preheat oven to 425°F. Add oil, onion, and garlic to pan and sauté on medium heat for 5 minutes. Step 2: Add cooked onion to food processor, along with chickpeas and lemon juice. Blend for 1 minute (chickpeas shouldn't become fully blended). Step 3: Add parsley, cilantro, salt, cumin, oat flour, chili flakes, and basil to food processor, and blend for 1 minute. Empty contents into large mixing bowl, and mix with hands. Step 4: Line baking sheet with parchment paper. Form palm size falafel balls, and place on sheet. Bake for 35 minutes.